“From the Desk Of…” challenges the dominant narratives about international peace and security by sharing notable quotes, anecdotes, prose and poems about women, peace and security. These are tidbits that float across my desk from time to time. They are from encounters with artists, diplomats, and human rights defenders. My hope is that this space can be an invitation to tell a new story about who we are now and create a narrative about the more peaceful future we are trying to build. Do you have something you would like to share from your desk? Drop me a line! 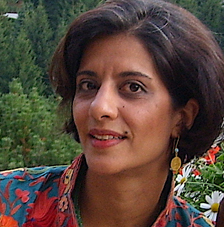 Rajkamal Kahlon is an American artist and educator. And she’s someone you should know. Her two projects, Blowback and Did You Kiss the Dead Body? 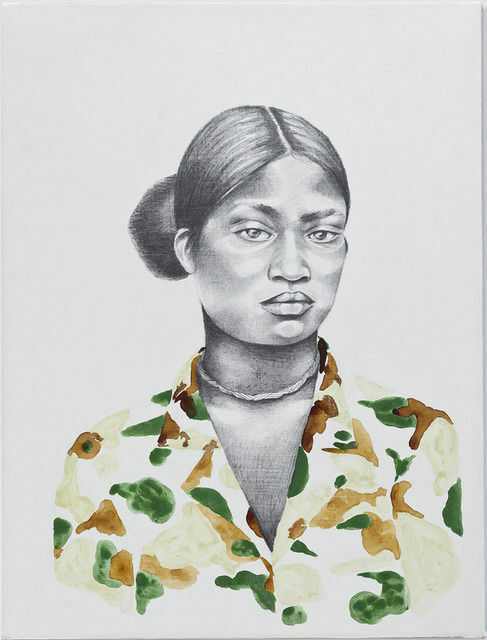 are intense examinations of US foreign policy and human rights.Kahlon’s drawings, paintings and performative installations use critical aesthetics and absurdist humor to challenge current policy and journalistic accounts of counter-terrorism and human rights. Her images are often found within already existing historical and contemporary colonial archives. 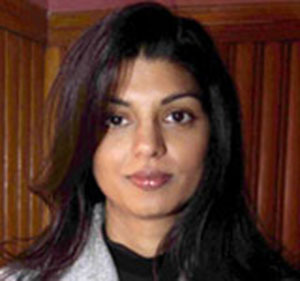 As an Artist-in-Residence at the American Civil Liberties Union, Kahlon interviewed lawyers in the Human Rights and National Security Projects, for her project, Did You Kiss the Dead Body?, which centers on US military autopsy reports of Iraqi and Afghan men who have been killed in U.S. detention facilities since 9/11. “From the Desk Of…” is my new initiative this year to challenge the dominant narratives about international peace and security by sharing notable quotes, anecdotes, prose and poems about women, peace and security. These are tidbits that float across my desk from time to time. They are from encounters with artists, diplomats, and human rights defenders. These people seldom meet except at my desk. My hope is that this space can be an invitation to tell a new story about who we are now and create a narrative about the more peaceful future we are trying to build. Do you have something you would like to share from your desk? Drop me a line! Do Men Have a Role to Play in Women, Peace and Security? Do we need men involved in the Women, Peace and Security agenda? Men’s organizations that promote gender equality and work to end violence against women are vital to advancing UNSCR 1325 and the Women, Peace and Security agenda in several key ways. First, men’s organizations that support women’s rights and gender equality can dialogue with already established Civil Society Working Groups on Women, Peace and Security active in 40-plus countries today. Civil Society Working Groups act like a consortium of women’s organizations and women experts that promote the development, adoption and implementation of National Action Plans on Women, Peace and Security. Men’s organizations that work with men in conflict and post-conflict situations to end violence against women can contribute vital information and recommendations gleaned from their on-the-ground work in refugee camps, disarmament and demobilization programs, and health programs to support the Civil Society Working Group efforts more broadly with government and military institutions. Second, we need male champions on human security issues who are willing to lead in a new role: Men can lead by supporting women behind the scenes. This means challenging the status quo around masculinities and men’s organizations are poised to take this on. It’s important to recognize that there is a need for different strategies to reach different male actors across sectors—in health, education, or in security sector reform. In the health and education sector, programs targeting fatherhood and boyhood/adolescent male issues will have different objectives than compared to the goal of engaging male leadership in security sector. Family planning organizations work with fathers and mothers to become equal partners in decision-making around reproductive health and childcare. Programs that target boys and young men tend to focus on exploring alternative masculinities that do not value violence as the ultimate form of power. On the other hand, success in engaging male leadership in political and security institutions does not depend on male leaders’ identities as fathers or sons. Instead, male leaders need policy support and coaching on understanding how gender equality can improve their decision-making and make them more effective at their job. However, this is not to say that the strategies are not useful across sectors. Many of the lessons learned and methodologies developed in the health and education sectors, such as Gender Equitable Men’s scale and measuring attitudes and biases of men toward women leaders, can be used in political and security institutions to assess gender biases that act as significant barriers to the advancement of women in the security sector or leadership positions in peace processes. Finally, UNSCR 1325 and the Women, Peace and Security agenda fundamentally aims for equality between men and women as a means to maintain international peace and security. So, do we need men to champion the Women, Peace and Security agenda? We need them as active partners who are critically examining their roles and creating new ways to support women’s advancement. The Women’s Learning Partnership will be hosting their inaugural online event with women activists and artists from the MENA region on February 5th, 2014 called the Identity, Gender, and Activism in the Middle East-North Africa Forum. Five young women hailing from Egypt, Iran, Lebanon, Morocco, and Yemen, will discuss art, public protests, journalism, democratic values, and gender awareness of local citizens. Though the current political environment in each of the speakers’ countries is diverse, all are marked by large populations of youth seeking new freedoms and social and political structures. As with many countries across the globe, these societies are also marked by pervasive gender inequality that impacts the speakers’ lives and how they seek to shape society. Forum panelists will share how political systems and gender norms have influenced their identity, and how each is striving to transform their society and their place within it. 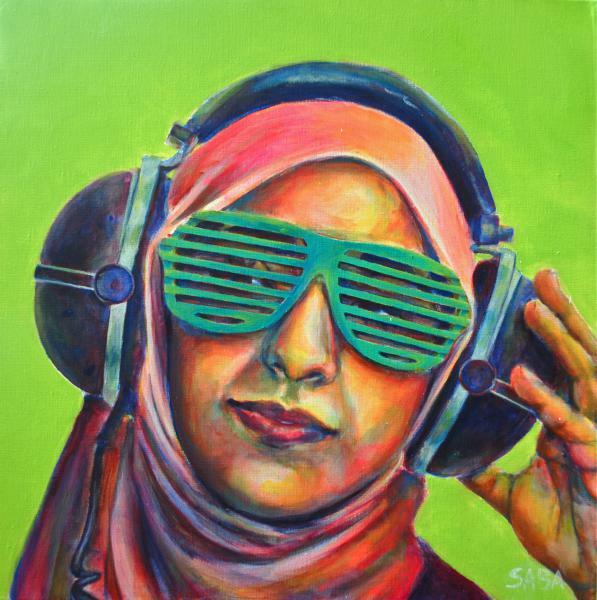 Painting by Saba Chaudhry Barnard, USA from her show, Technicolor Muslima. Nikoo Tarkhani (Iran) was born in Tehran, Iran. She graduated from medical school but her enthusiasm and passion was always Art. Since 2001 she has participated in numerous exhibitions in Iran, Sweden, Mexico, the UK, Brazil, the UAE, Germany, and elsewhere. Nikoo’s work Muslima was recently featured in the International Museum of Women. Atiaf Zaid Alwazir (Yemen) is a freelance researcher and writer focusing on social movements, in particular in relation to women, and youth; and role of regional and international policy in Yemen. Her work has appeared in Foreign Policy, The Arab Reform Initiative, Project on Middle East Democracy (POMED), Jaddaliya, Al-Akhbar, Huffington Post, the Guardian, and other outlets. She is also the co-founder of the media advocacy group SupportYemen (www.supportyemen.org). She chronicled the Yemeni revolution on her blog (http://womanfromyemen.blogspot.com/) with commentaries, videos, and photographs. She has an M.A. in international relations, and Her thesis focused on Women in Prison in Yemen, between honor and crime. Jihane Hannane (Morocco) is a 22 years “young” feminist activist with Association Démocratique des Femmes du Maroc (ADFM), WLP’s partner in Morocco, and is currently completing her studies in Political Science, with honors. Jihanne also works for the International Labour Office in Rabat. Previously, she was selected to participate in the country’s parallel youth government, in which she held the position of Youth Minister for Solidarity, Women, Family, and Social Development. She has also worked on issues pertaining to social entrepreneurship with the organization Students in Free Enterprise (SIFE) and was responsible for communication for the African Youth Initiative for Climate Change (AYICC). Hayat Mirshad (Lebanon) is a feminist and human rights activist, researcher, trainer and journalist. She is a co-founder of FE-MALE, a non-profit organization, founded in 2012 by a group of young Lebanese women and human rights activists, and editor at Sawt Al Shaab, where she volunteers to produce and present the first feminist radio program in Lebanon and the Middle East, “Sharika wa Laken.” She also currently works as a media officer and project coordinator for the “Women’s Response to the Arab Spring” project at the Lebanese Democratic Women Gathering and is active with many civil society and women organizations and campaign such as the Lebanese Women Right to Nationality Campaign, through participating in their awareness campaigns, demonstrations, and other mobilization events. She previously worked at the Collective for Research and Training on Development-Action CRTD.A, WLP’s partner in Lebanon, for four years as a project officer for the Active Citizenship and Gendered Social Entitlements project. In addition to that, she is a freelance reporter at Lel Nasher, a weekly talk show hosted by Tony Khalife at Al Jadeed TV Production. Noora Flinkman (Sweden/Egypt) is the Communications Manager for Harassmap, an NGO dedicated to combating sexual harassment in Egypt. Her interest in gender studies and rights activism brought her from Sweden to Jordan, Saudi Arabia, and finally to Egypt where she finished her M.A. in Middle Eastern Studies and joined HarassMap. Noora also has a bachelor’s degree in Peace and Development Studies.